As Dartmouth’s Web Director, my responsibility is to manage and coordinate all development of Dartmouth’s digital environment. Admissions is an important property in that environment. When it came time for a redesign, I persuaded Admissions to work with my in-house group, Web Services, rather than outsource the project. Having won Admissions as a client over external vendors, I was under pressure to deliver a service that would be comparable. However, because of my broader role at Dartmouth, I had to develop the site within the greater context of the Dartmouth web. The entire process required that I perform a careful balancing act of responding to requests while adhering to institutional standards and meeting user needs. When it comes time for decision-making in the design process, I have found the best approach is to let users drive the process. User-centered design takes the decision making out of the hands of the designers and stakeholders, and instead allows user needs and preference direct decision-making. We started the process with usability testing of a range of admissions sites at other institutions. We wanted to see how prospective students approach the process of finding a good match in very different contexts. In observing about 5–6 high school students it became clear that the process of finding a good school was very similar to that of finding a good partner. Prospective students first determine whether they are right for the school by looking for data, such as average test scores of admitted students. If they pass the “fittedness” test, then they explore whether the school is right for them—the location, whether it offers a major in their field of interest, athletics and arts offerings. If the school passes the test, then they look to the application process. As a result, our strategy was to provide prospective students and parents with data right up front. 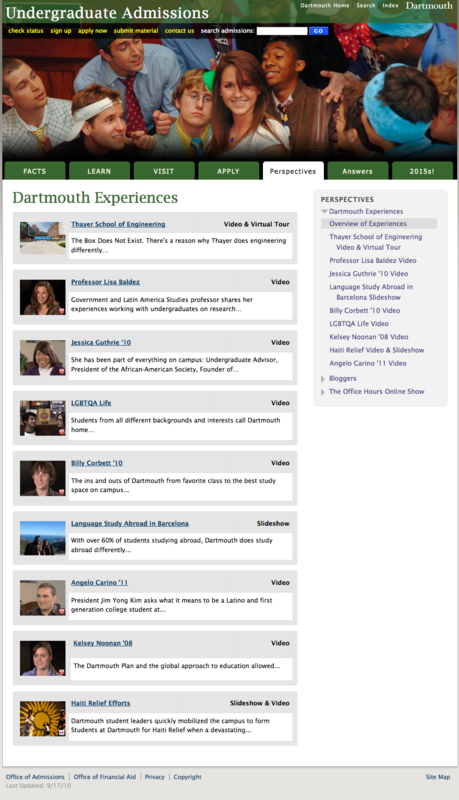 The current site has “Facts” front and center, complemented by images, videos, narrative, and stories that demonstrate that Dartmouth students are admitted for more than their ability to do well on standardized tests. 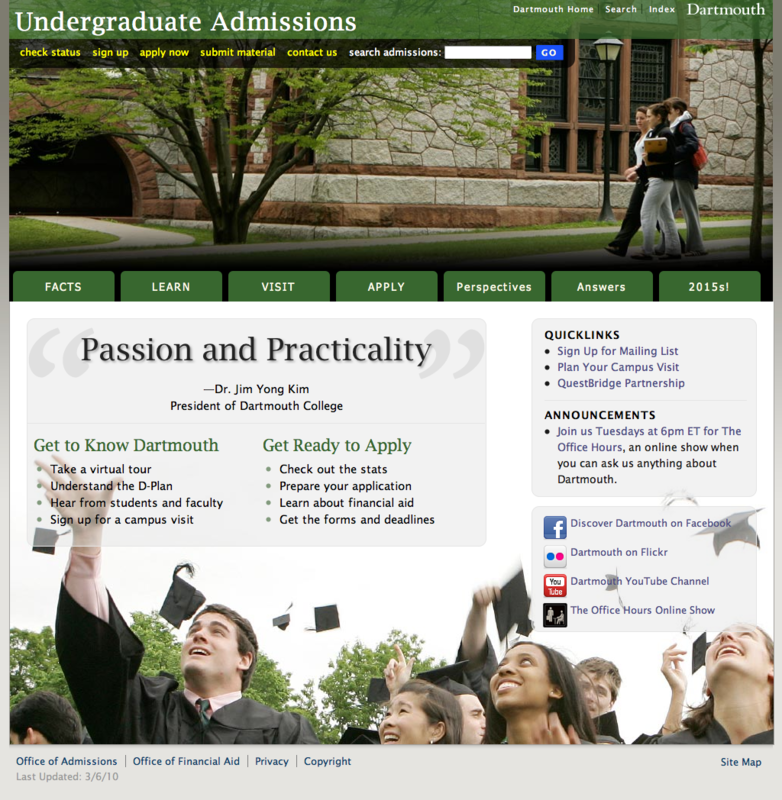 The information design supports the natural process flow, with the “Facts” and “Learn” sections providing ample opportunities for prospective students to determine whether they are right for Dartmouth, and whether Dartmouth right for them. The “Visit” section supports the next phase in the process, providing information and opportunities for both virtual and physical campus visits. And the “Apply” section is the final step in the process, with information and functionality to support prospectives who have decided to take the plunge and become applicants. In April, when decisions have been made and applicants have been notified, the architecture also supports admitted students with a “Class of 20XX” section. The site also has an “Answers” section that answers commonly asked questions. Supporting these more practical needs is the “Perspectives” section. Here is where we attempt to communicate the richness of the study body through a variety of first-hand perspectives on the Dartmouth experience, through interviews, student blogs, live office hours, and more. This section aims to accomplish a challenging task: to provide authentic stories within the context of an official admissions website. We continually explore which means of communication is the most useful, impactful and, most importantly, credible to prospective students. The visual design is modeled on a flexible, grid-based layout. I generally build flexible, or “liquid,” layouts, but this was the first time I did so on a grid, and the result provides the best of both worlds. The page elements harmonize, and yet they scale to accommodate different window widths and text sizes. And the line length cannot become too long since the layout is restricted to a generous but readable maximum width. All of Dartmouth’s sites are built on the same codebase, so the Admissions site uses mostly the same code as, for example, Classics, Budget, and the Office of the President. This architecture allows for site-wide changes, such as the inclusion of an emergency banner on all sites in case of an emergency. It also allows a small team of web professionals to provide support to all Dartmouth departments and programs. On the down side, it limits design options.